I’ve always loved driving down long stretches of road on heat saturated days, fascinated by the quivering sections of humidity dancing ahead of me on the road; I always imagined them to be clear, bottomless wells of water, but they always dissipated before I could ever test out that theory. I would arrive to where it appeared to be, only to be met with a traffic light instead of the sanctuary I had hoped for. You could say this very scenario was the template for which my relationship with the Lord took shape in the last couple years. I was going down the proverbial road crying out regularly for the Lord to write my story, write it out loud, to just give me what I wanted. In my fleshy and impatient human nature, I would grow weary of how He was doing things and I would try to take over. Those shimmering sections ahead of me, on a path I was convinced I would have to make for myself, came in many forms, but they all found me in the most desolated and parched of temperaments when they disappeared. In November of 2014 I read a book about being brave for the sake of Jesus’ kingdom and began to consider what that might look like in the parameters of my life. Formerly having worked for an inner city school, I spent the better part of two and a half years encouraging angsty, but incredibly lovable, students to step out in bravery for their peers and themselves, but was at a loss for how I would step boldly in bravery for myself. In the midst of foraging for answers that wouldn’t cause me to step out of my comfort zone, the Lord placed a country on my heart that terrified me. While I was busy asking for bravery within the only area code I’ve ever known, my King quite delicately laid down India and then took a step back. June of 2015 found me boarding a plane to Hyderabad, India with the mindset that I would arrive, God would move, and then I could check the international missions box off my list in its entirety. It was a well laid out plan save for one particular element. I wasn’t writing the story. I arrived in India a skeptical believer. I loved Jesus and trusted Him with most things, but my whole heart wasn’t necessarily among the entrusted. I would pray for the things I wanted, and felt I needed, and when He didn’t deliver in the time I allotted Him, I took control and inevitably ended up a more broken version of an already deteriorating person. What followed were days filled with more color and laughter and vibrancy than I knew existed in the world I had occupied for 27 years. For the first time, perhaps ever, I felt the freedom that comes with allowing God to fight the hiccups, battles, and sadness that can wage within your heart. It was with these walls of isolation being broken down that I came to spend time with a thirteen year old boy on the Back2Back campus named Goutham. For several years leading up to going to India, I was wholly convinced that my life would really start when I got to have my own love story. Even in the months before leaving for Hyderabad, I would pray fervently, desperately, for the Lord to write a love story for me. 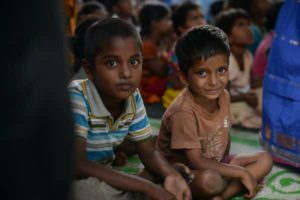 I never expected for this desire to go away, or lessen, by following God’s call to India. I simply thought He wanted me to love children outside of my own city. The first time I talked with Goutham he was making a tambourine and wearing a light blue shirt with his collar popped. He lifted up his tambourine and smiled at me and all I could manage to think was that he was the very reason I was called to India. Only in the days and months that have followed my return to Dayton have I realized that the Lord was never ignoring my prayers. He wasn’t ever turning His back or shaking His head in flippancy over the desires of my heart. It is with complete trust and hope in His authorship that I now realize He had been writing a love story for me all along. He just needed me to arrive in India before I got to be a part of it. I was called to India in November of 2014 and uncharacteristically said yes. I could talk for hours about what I learned there, the ways I felt Jesus within the traffic riddled streets and honking horns; I could spend days remembering and sharing all the ways He plucked me from before my idols and met me in a foreign land and completely wrecked my heart. He took me into a country that doesn’t worship His name or fight for His kingdom and He opened my eyes to what poverty looks like – He put faces and names and stories to a concept I may never fully understand on this side of Heaven – and He asked and allowed me to fall in love. My God worked through a 13-year old boy with a world-changing smile to finally help me stop and listen. 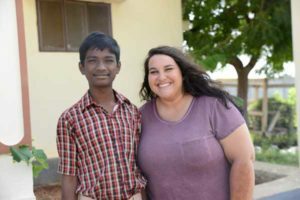 He called me to sponsor Goutham – to love him and help him and support him spiritually and only through these acts of obedience have I gotten a fraction of a glimpse of how my Father sees and loves me. India was an answer to a prayer I never knew I needed to be praying. Goutham was an answer to a prayer that I never could have seen coming. Together, these are the most intricate, delicate, and mesmerizing love letters I’ll ever receive. What followed that first trip to India was an entire heart overhaul. I returned and began to truly, for the first time, consult with God about what was before me. In short - a career change, a long-held dream coming to fruition, and more trips to India were in the blueprint. And truly, He continues quieting the voice inside me saying I know best with every moment He proves I’m never unseen. He knows my heart and its inner most parts more intentionally than I could ever hope to. And so it was on the last night of that trip, when Goutham put his hand on the glass window of the van, looking me square in the eye, willing me to be palm to palm with him, that I realized a heart can willingly and joyfully break; in order to have a piece remain where you’ve fallen in love and also to return to where you were first loved at all. Apex has a longstanding relationship with partners in India through Back2Back, TENT, and other organizations. If you would like more information about how you, too, can come alongside the indigenous church in this area of the world, please email going@apexcommunity.org. Newer PostWhat If God’s Desires Are Not Our Own?